Protect all your work and save your S-Trader files locally or on cloud. Ensure smooth migrations and speedy disaster recovery by restoring all your files within minutes. Upon installing the S-Trader, an application-specific sub-folder is placed in the Documents folder. Its path will be C:\Users\Your User\Documents\S-Trader. 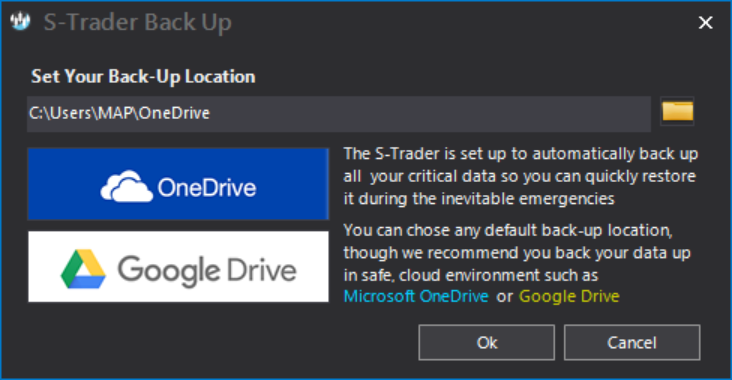 You can set the S-Trader up to archive/zip this folder and upload it at a local or cloud location of your choosing to ensure your files are always backed-up when closing the application. The restoration of backed-up files can be done in seconds or at most minutes. This ensures valuable work is never lost in the event disaster strikes and also ensures smooth transitions when migrating from one computer to the other.